← Nabari No Ou Series Review-ish. Well, to be honest, I didn’t really enjoy it at first because of the slow pace in the beginning and I expected for it to be a series full of action but it’s not. It has action and whatnot but that genre doesn’t dictate the entire series. It seems to have this calm and collective feel to it. Anyways, the series would be more of an adventure where you follow along with Jet and Spike whom you know almost nothing about. You see how these two develop into fantastic characters as they meet new people and two of which a women and a child join Jet and Spike and go through all these phases together, changing. The characters seem to have a realistic feel to them because they each have flaws and they aren’t exempted from injuries or even death itself. Several times, it’s made clear that these characters aren’t superior in any way. They’re just your average characters who have a few special and exceptional skills. Faye is manipulative and selfish. Jet is bossy and controlling. Spike is hotheaded and troublesome. Ed is TOO carefree that it could put her in a precarious situation. All these differing characters are put together to form a group that’s fun and distinct. 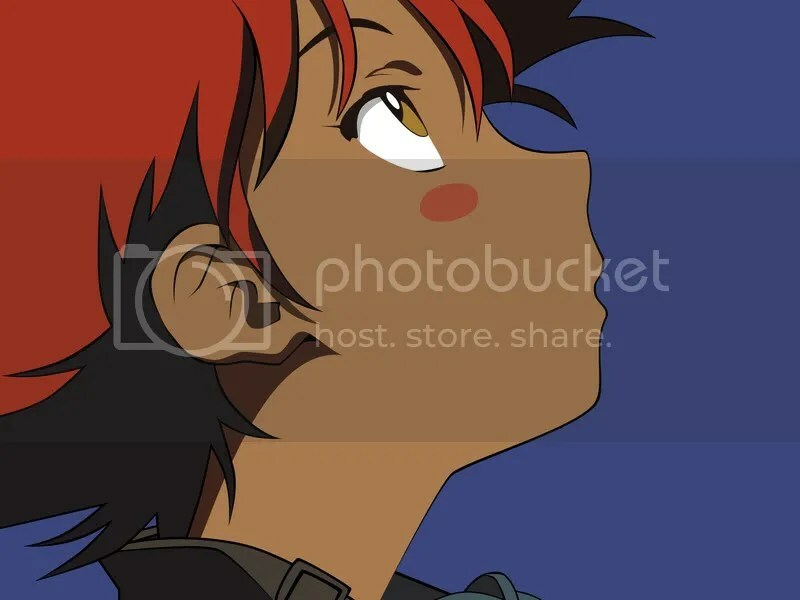 What I love about Cowboy Bebop is Ed. She’s really different. Her attitude and eccentricity makes her really likable– for me. It was really adorable how Ed would call Faye ‘Faye-Faye’. I also liked Spike and Shin. There were a few specific episodes that I want to talk about. Toys in the Attic. [I think that was the title, I can’t remember] OMG, This episode had me at the edge of my seat. I’m really not good with horror stuff. This episode dealt with an unknown creature that those bitten by it would end up infected with a sickness/disease. The way it was depicted and not knowing what it was had me scared. I thought something was going to pop out. I fear what I don’t know and seeing as I didn’t know what that crawling thing was, I feared it. Yeah, that’s pretty lame of me but.. whatever. >3> But I did find it funny to find out that Spike had left a lobster in the fridge for over a year. 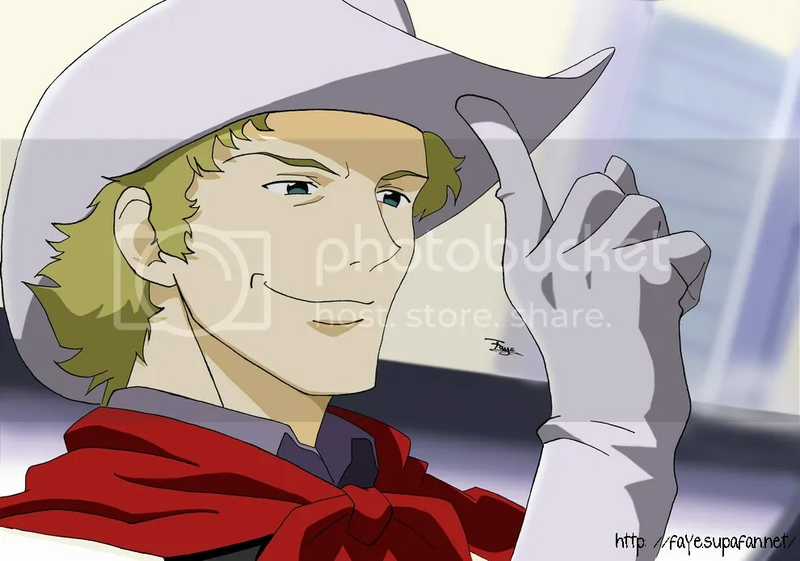 Cowboy Funk– =_= That Andy dude.. It was hard watching him mess up one thing after another and making the same mistake after another. It was so agonizing watching him. What was really nice was that the show actually showed Julia and you get to see what kind of a person she is. Throughout the entire series you only get an impression of who she was through Spike’s eyes and not who she really is, so it was nice. Overall, it was good and I enjoyed it. It was really different with a futuristic world idea. 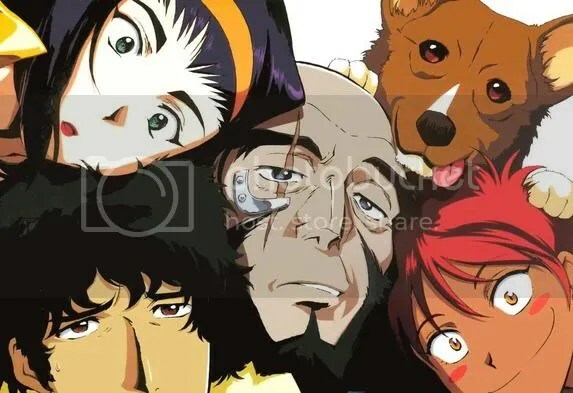 It seems as if it is possible for the world of Cowboy Bebop to be a reality. It’d be fun to be able to pilot something that’s similar to Swordfish. This entry was posted in Anime, Cowboy Bebop, Finished and tagged action, anime, cowboy bebop. Bookmark the permalink. I’ve been meaning to finally watch Bebop, but seems I may never, because of my laziness. What would make you motivated to watch it? Lol, I do too. She’s just too adorable. She adds this unique feel to the series. 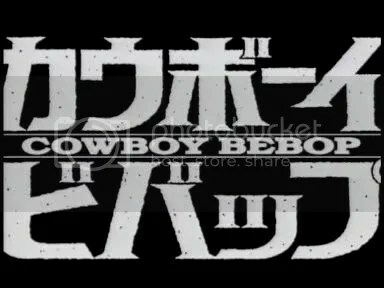 I LOVE COWBOY BEBOP.though Ed is a nice girl and a really unique one O.O I like the seriousness in this series. Ed is one of those really memorable characters. At first, it was a bit difficult understanding that she’s actually a she and not a he.